Where do I use my boohooMAN voucher code? Click on the deal or code you would like to use at NetVoucherCodes and follow our link to the boohooMAN site. Browse for the menswear you would like to buy. Enter your delivery address and choose a delivery option then click ‘Proceed to Billing’. Enter your billing address details and then enter the promo code and click ‘Apply’ before entering your card details. BoohooMAN is a fashion retailer for today's fashion conscious young man. Their garments combine the latest on-trend designs with an affordable price tag so that you can wear the latest styles without placing too much of a strain on your wallet. Shop here for stylish coats, jackets, knitwear, trousers, hoodies, T-shirts, shirts, jeans, shorts, loungewear and footwear for men. They have regular sales, money-saving offers and codes so that you can dress to impress without breaking the bank. Using a discount code from BoohooMAN is a great way to save money on your purchase. Regular codes are on offer, giving discounts on either select products or your whole order or sometimes giving free delivery. Even when a discount code is not available, it's well worth your while to check here at NetVoucherCodes to see what other money saving deals or sales are on offer, so you don't miss out on the chance to grab yourself a bargain. The BoohooMAN Basics Collection is a range of basic no-nonsense clothes at no-nonsense prices but still with the unmistakeable BoohooMAN quality and style. The range includes T-shirts, joggers, hoodies, polos, shirts, knitwear, loungewear, trousers, shorts and footwear. So you can completely kit yourself out in basic but fashionable clothing at a very basic price. Buying your clothing in Multipacks from BoohooMAN is a great way to get value for money. Packs of two or more T-shirts, shirts, polos, joggers, socks and shorts are available offering great value and enabling you to buy all your wardrobe basics for very little money. With BoohooMAN Multipacks, you don't need to compromise on style or quality to get affordable clothing. See all other Delivery Options here. If you're wanting to return an item to BoohooMAN, it is completely free and easy. You will need to ensure that all tags and original packaging are attached to the product and in a re-saleable condition. You will need to return your item within 14 days of receipt in order for a refund to be processed. See the Customer Service Page for all Help Details. 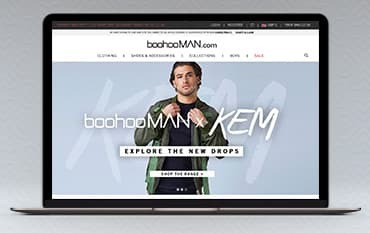 From the success of boohoo.com comes boohooMAN bringing something new to the menswear market and offering the latest trends for the young man of today at an affordable price. Here you will find the latest styles of T shirts, knitwear, hoodies and sweats, shirts, trousers, joggers, shorts, outerwear, footwear and accessories. They have regular codes and money saving offers and give a discount to students, so you can get the latest fashion and look good without breaking the bank.